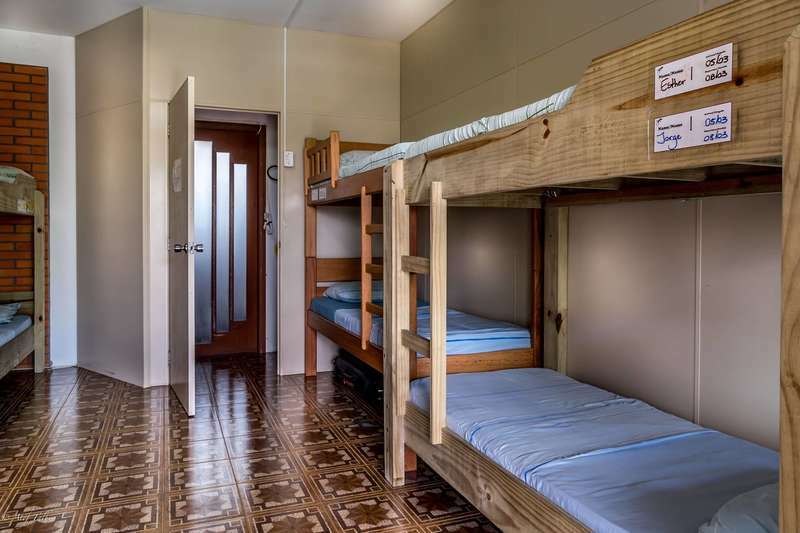 There are one 6 Bed Mixed Dorm ( basic with fan), one Deluxe 4 Bed Female Dorm (with AC), a Deluxe 8 Bed Mixed Dorm ( with AC), a Superior 6 Bed Mixed Dorm( with fan, balcony, garden/pool view and hammocks), a Superior 8 Bed Mixed Dorm( with AC, balcony, pool/garden view, hammocks),a Double Bed Private( with AC). Geckos Property is powered by solar panels, much of our furniture has been made with recycled wood. We make a separate collection of waste materials in order to run our property in an eco-friendly way. We have a very large common area with many facilities: satellite TV, DVD, computer, books, travel guides. Additionally there is nice patio, balcony, garden with a clean pool, a bar/bbq area and many hammocks for recovery after a long day at the beach! -1) Take the 183 or 186 bus to the CITY CENTRAL BUS TERMINAL. -2) Take the 320 or 330 bus to LAGOA DA CONCEIÇÃO TERMINAL. -3) Take the 360 bus to BARRA DA LAGOA and get off in front of restaurant Oliveira (3rd stops) before the bus crosses the bridge. Look for the supermarket Supefloripa, walk towards keeping to the left and you will find Rita Lorenço da Silveira street. We are number 325. We are 20 metres after Mercado Jesus. Once at LAGOA TERMINAL, take the 362 bus to CANTO DOS ARASAS or the 363 bus to JOAQUINA and get off at the Mercado Jesus bus stop, right in front of our property. Once at LAGOA TERMINAL you can walk to the property. It is 10-15 minute walk through the town. it is not free, but a service payment. -1) Leave the LONG DISTANCE BUS TERMINAL and walk to the right for 200 metres until THE CITY BUS TERMINAL. -2) Follow the steps above from step 2 onwards. We accept EURO and USD. Reception open 24 hours a day. Check out time: before 12.00 pm. Check in time : after 2.00 pm. Breakfast from 08.00 to 10.00. **Unsuitable for children. ** CVC of the credit card used to make the booking and arrival time are required to confirm the reservation. Falilure to provide these informations, will result in cancellation of your booking. No animals allowed. You will be charged 50% in advance in order to secure your booking (non refundable), you may be contacted by the property requesting the CVV code of the credit card used for this booking or asked for a deposit.